Okay, this is not the only reason I bought the boots, but the reason I couldn't wait for fall like most sane and ordinary people had nothing to do with industrial collapse. I had to have the boots by today because I wanted to dress up like a Jedi for my son's birthday party. Here I am teaching a crowd of nine Kindergarten Jedi the ways of the force. 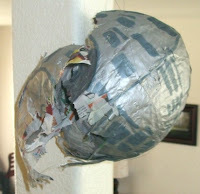 They did very well, and thoroughly destroyed the death star for a big finish at the end of the training session. 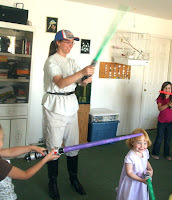 If any of you want to have your own Jedi Training Academy party, I'll tell you it was really easy. Pass out light sabers, make it clear that sabers are ONLY for whacking at other sabers, not at people or furniture or walls or ceilings, put on some Star Wars music, and let them go! They loved it. We did play one organized game I would like to mention: I had the children pick partners and gave each pair a light saber and a bottle of bubble stuff. One child blew bubbles while the other tried to pop them with the light saber. I also took a movie of each child individually showing off his or her best light saber moves. I could tell that some of those little Jedi had been practicing at home! My six-year-old asked for a Star Wars party for his birthday. 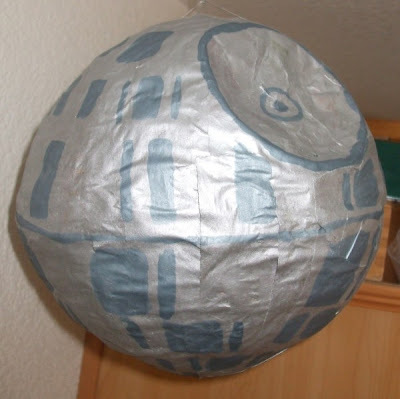 This is the pinata that I made for the party. My daughter helped me paint on the details. Since industrial collapse is imminent, I thought I'd better go out and buy myself a nice pair of dress boots while I had the chance. I've always wanted a pair, and my mother sent me some birthday money, so I set off just after lunch to find some. Unfortunately, this is not boot season. For some reason, all shoe sellers and department stores believe that no one will get a sudden urge to buy boots in the month of April. I visited four stores before I found any boots at all, then it took three more stores before I found a pair of boots my size. On the other hand, because no one wants to buy boots in April, they were on clearance! Happy Birthday! It's the End of the World! A good friend of mine took me out to breakfast for my birthday. She's a great storyteller, and I loved sitting there listening to her relate the adventures of her family and friends. I sat riveted as she told me about the time her brother had to land a 747 on a one-lane country road because of engine trouble. And then the conversation turned to the fact that there are no bananas at Costco. "In Los Angeles, Costco is limiting the amount of flour, beans, and rice that people can buy," she told me, wide-eyed. "On the radio I heard some Wall Street guy say that we need to plant our gardens and get our food in because our entire way of life will end before the year is out." I'm getting scared. Then she tells me how there's a butter shortage in Japan (to me this seems akin to having a kimchee shortage in El Paso), and how President Bush has been asking the media to cover up all these shortages so as not to incite panic. "I just don't know why all of this isn't on the national news!" she tells me. What I think but don't say is that the news is here to tell us what has happened, not predict what is going to happen. I assume that if industrial civilization does collapse, it will be on national television. While she tells me how she and her husband are going to sell their house and move out to the country before the riots begin, I remind myself that I've already got enough wheat, beans, and rice stored under the beds to feed my family for a year. I guess if the starving rioters come I can hand them each a can of wheat kernels, like they'd know what to do with it. So if industrial civilization does collapse, I'll just say farewell in advance, dear blog readers, though it is my opinion that if Americans learned to use public transportation instead of commuting to work in their SUV's, there would be plenty of gasoline left for the food trucks. Have a nice day! Our ward (congregation) is moving out of our current church building and into another one. I was down at the church this morning for a toddler music time that I teach every week, and some of the ladies from the Relief Society were there cleaning out the closets. They said I could take anything I was interested in. I am now the proud owner of a large tote full of tole painting supplies, a 10"x13" wall mirror, several blank cassette tapes, a bottle of Italian salad dressing, six dowels, a skein of yarn, a box of toothpicks, and fourteen small tubes of hand cream. Happy early birthday to me! Last Thursday I put my youngest child in cloth underwear. After all my experience with this milestone in life, I've determined that there is no quick, easy, secret formula. It simply takes patience, kindness, persistence, and lots of extra loads of laundry. The past few days I have spent simply getting my son used to the routine. I taught him how to pull his own pants down and sit on the pot. I've gotten him used to the idea that several times a day he has to stop what he's doing and go to the bathroom. He just doesn't know what it is all for. Not yet. Today was to be the day. Today we were going to sit and wait until it happened. I decided that I would set up the lap top computer in the bathroom so my son could watch video clips of his cousins while we waited. So I took him to the bathroom and told him to get ready while I went to get the computer. When I came back, he was standing in a puddle. "No! Stop!" I wailed, "You're supposed to do that in the toilet!" but it was too late. If only I had done what I'd been doing the past few days, it would have worked! We would have finally had success! But no, I had to try something new, and miss another chance! I flopped down on the footstool and curled up in an agony of regret. "Mommy, you okay?" my son asked. And I wonder why my children are so dramatic? "This is Kathy at the school office. Your son had an accident and needs a change of clothes." The word "accident" drove a momentary pang of terror into my heart. I was imagining bleeding heads, broken limbs askew, and then it registered just what kind of accident Kathy the office attendant was talking about. Oh, that kind of accident. I looked at the clock. It was only thirty minutes until kindergarten let out, "I can bring him a change of clothes. Then I'll just take him home. Is that all right?" "Yes, that will be fine. See you soon." When I got to the school I found my child sitting in the nurse's office, hunched over and forlorn. I took him back to the bathroom to change him. "You just have to be quicker to get to the bathroom next time," I said in my everything-is-okay mother voice. "I did but someone was already in there!" he complained. "Oh," I was sorry I had blamed him, "Well, these things happen sometimes. Are you ready to go home?" As I left the nurse's office and came around the counter I asked Kathy the office attendant, "Do I need to sign him out?" it was only five minutes until the bell. I started filling out the information on the "Student Sign-Out" log. I got hung up on "Reason." This was not something simple like "dentist" or "orthodontist." How should I put it? I had to bring my child a change of clothes and decided to just take him home simply would not fit in the little rectangle, even with my tiniest print. "Have you been helped?" a stranger, some new worker at the office, came up to the counter. "Just signing out my child." I said, deciding to put the word "accident" under "Reason." "I'll need to see your photo I.D." she said. "I haven't got it." I told her. I had walked. I live one block from the school, so walking is faster than taking my car. I don't need a license to walk to school. "Kathy knows me." I looked around for her, but Kathy had vanished. The woman took a deep breath as if getting ready for a battle, "Kathy might know you, but I don't. You can take him this time, but in the future, you need to bring your ID." My mother instincts were raging. This woman dared to suggest that they might not hand over my own flesh and blood just because I didn't bring a little plastic card with my name and picture on it? "I can sit right over there and wait for five minutes if it's a problem." I said through gritted teeth, thinking I've had children at this school for four years, I volunteer at this school for five hours a week, grab any teacher out of the hall and she or he can probably tell you who I am, but you need to see my ID? What am I, chopped liver??? "No, that's fine. You can go. Just remember to bring it next time." As if I should have known the school would suddenly after four years start insisting on checking ID whenever a parent takes out a student! I stomped out of the office and got halfway down the block before I had to stop. I felt terrible. I had been rude! I had been one of those rude parents that the office staff tell "I just can't believe she was so rude" stories about. I had to go back and apologize. "Can I help you?" Kathy the old familiar office attendant had reappeared when I reached the school office again. "I just came back to apologize to . . ." I didn't know the new woman's name so I just pointed at the top of her blond curly head which I could see over the barrier of her cubicle. "I'll get her for you." "I just wanted to say I'm sorry I was rude. I do understand and I appreciate you trying to keep my children safe." "That's okay," she took my hand over the counter and smiled at me. I sobbed half the way home. My first chance to handle a Dremel came when my friend Heidi loaned me one so that I could cut notches in the pins for my very first harp. The ceramic cutting wheel sliced into the little aluminum rods like they were butter. 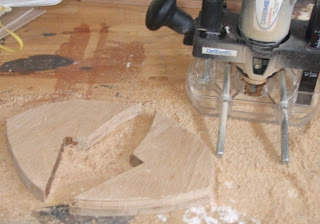 I didn't want to give the Dremel back. I wanted a box from the top of the cardboard box pile in the garage so I stepped up on an old bucket. As I reached for the box I got this feeling that I really ought to go get a stool. CRACK! The bucket lid shattered under my weight. One foot landed on the ground, but the other dropped into the bucket. It took a moment to register with my brain that the foot in the bucket felt cold and wet. 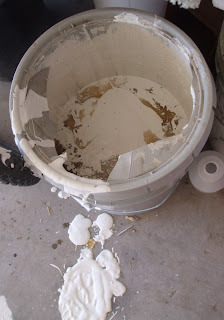 I had climbed up onto a five gallon bucket that was half full of white paint. My left shoe dripped, coated like a caramel apple, as I pulled my foot out. "Oh wow, mom!" My twelve year old daughter was impressed. "Hey, can I try and wash it off?" "Sure," I said as I slipped the shoe off, then peeled the sock off after it. The sock went right in the trash. The paint had splashed up inside my favorite brown courderoys, so I eased them off and headed upstairs for the shower. A lot of hot water and soap later, the pants were saved. My daughter cleaned the shoe off and I poured the rest of the paint into another bucket, but it took an entire half hour to clean up from that one mistake. The moral of the story is, use a step stool. 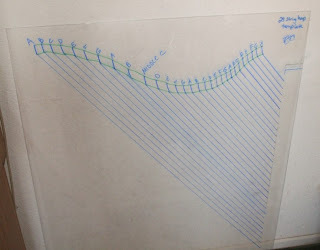 I splurged at Lowe's and bought a piece of plexiglass to make myself a nice template for my 29 string harp design. I did not make a template the first time I built one because I wasn't sure the design would work. Now I know the design works, and this time I was able to take into account some details I overlooked the first time, like the fact that the pins and pegs have width! Maybe it was my physics training- we used to always use massless strings and frictionless surfaces. Why not two dimensional pins? You can't see it in the picture, but I've got a hole drilled in this template to mark the precise location of each pin, each peg, and each hole in the string rib. That's eighty seven little holes! In other news, more wildflowers are coming up in our yard. 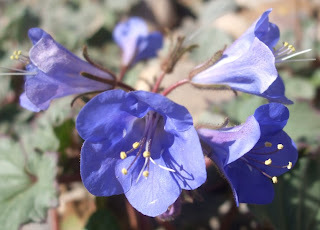 This little beauty is known as a desert bell.